The band's moniker comes from a discarded coat James saw while walking through the remains of his favorite bar the morning after it burned down. The coat had the letters "MMJ" embroided on it. The band has released six albums so far: "The Tennessee Fire" (1999), "At Dawn" (2001), "It Still Moves" (2003), "Z" (2005), "Evil Urges" (2008) and "Circuital" (2011). The band's breakthrough came when their 2003 single "One Big Holiday" became one of the most played songs on college radio that year. 2008's "I'm Amazed" was also a sizable hit, peaking at #6 on Billboard's Triple A (adult album alternative) Singles chart. 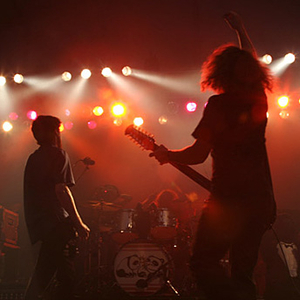 The Circuital songfacts reports that "Circuital" was recorded inside a church's converted gymnasium in the band's hometown of Louisville, Kentucky. Said frontman Jim James: ?I hate the phrase ?going back to our roots', but for this record we came home and made it in Kentucky. And it just felt a lot like it did when we were first starting out.? James co-produced the record with Tucker Martine. The pair first worked together when James appeared on Laura Veirs ' album "July Flame" in 2010, which Martine, Veirs' husband, also produced.